Book the best Face Painters in St. Louis. At Circus Kaput Face Painting is for Everyone! Watch your guests be transformed into works of art as our professional Face Painters work their magic. If you're looking for the best Face Painters in St. Louis we've got you covered. Our Face Painters are the perfect addition to your event! "I wanted to thank your staff for all their hard work during True Blue Fan fest. The event was a success and everyone enjoyed themselves. The adults and kids enjoyed having their faces painted. Your staff did an excellent job!" Watch our Face Painters at work! Bring our Face Painters to your event. Contact us TODAY! 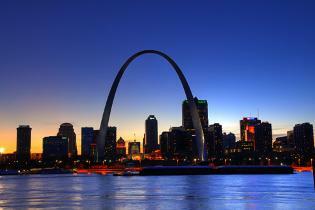 We are based in St. Louis, Missouri! "Your talented face painters were AMAZING and they proved to be very popular." WE ALSO BOOK BALLOON ARTISTS, MAGICIANS, JUGGLERS, AND MORE! Our St. Louis Face Painters Create Art On You And Your Guests! Circus Kaput's St.Louis Face Painters are artists and your guests are the canvas. We arrive complete with a board showing our face painting designs but also paint custom work for every person that sits in our chair. Working with us is easy and fun! "Circus Kaput came to our Fundraising Event. They provided Juggling, a Magic Show, a Circus Workshop, and Face Painting. I have never laughed so hard during a magic show in my life! We put up pictures of the kids (and adults!) with their faces painted in our office! We'll always remember this event." "Ginger and Josh did my son's 4 year Birthday Party! They did a great job I would recommend them to anyone. They kept the party moving and the kids attention and they loved it, and the adults enjoyed it to! They both have unbelievable talent; Ginger and her face painting is amazing and Oh My Gosh Josh my son is still saying that while he runs around giggling and pretending to do magic tricks! It was a birthday party that he will always remember for sure and all his friends to! I just want to say thanks to Ginger and Josh for helping make it possible!" 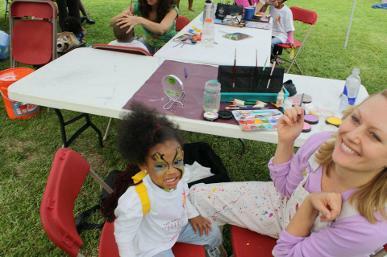 At St. Louis Face Painter, we believe that face painting can be enjoyed by everyone - young and old alike! We have a lot of fun at our events! We also put our focus on the person being painted, so they feel special and important. Doesn't that sound like the kind of experience you'd like to give your guests? Click here to find out how to get the most fun out of your St.Louis Face Painter event! We can definitely come to your event's location, but if you NEED A PLACE TO HAVE YOUR PARTY we can help. Are you looking for a fun and economical party room for 100 people or less? Check out Circus Kaput's St. Louis Event Space! St. Louis Face Painter's events are exciting and entertaining. bring even more fun to your event with our other entertainment options like juggling, comedy hypnosis, stilt walking, sideshow, and magic. We are sure you will agree, Circus Kaput does great events in Missouri and Illinois. The best midwest event entertainment whether you are looking for hypnotists, magicians, caricaturists, face painters, jugglers, stilt walkers, fire performers comedians or more for your next birthday party, block party, wedding, corporate event, mitzvah, festival, school assembly or any other type of event in Missouri and Illinois.